A bridge replaces a missing tooth by using the patient’s other teeth as anchors. A dental bridge is a natural-looking device that’s custom-made to fill a gap in your smile caused by one or more missing teeth. Two of your natural teeth are used as anchors to hold the bridge unit. Dr. Roe is an experienced prosthodontist who is an expert in restoring and replacing teeth. He received three more years of training in addition to the standard four years of dental school. Dr. Roe also has years of experience creating durable, comfortable bridges that look natural for his patients. A dental implant used to replace a missing tooth doesn’t require that the patients other teeth be altered like with a bridge. 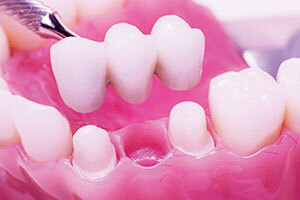 There are other options for replacing one or two missing teeth, or even several missing teeth. After an exam and X-rays, Dr. Roe can go over these alternatives with you. Depending upon your specific situation, he will advise you which is the best solution for you. An implant-supported bridge is an excellent option for someone missing multiple teeth all in a row. Instead of anchoring the dental bridge to the patient’s other teeth, dental implants are placed to act as the anchors. Learn more about the benefits of implants. The normal charge for the above service is $140.